In 1911, place of honor in the Annual Winter Exhibition of the National Academy of Design in New York was assigned to a painting by thirty-year old Russian artist Nicolai Fechin (1881–1955). His “savage, splendid, and heterogeneous” canvas displayed a “barbaric mastery of form and color.” Fechin’s early preference for thick layers of color and pigment with very little oil, and a penchant for conflating the real and the abstract, would bring him international acclaim in the first decades of the 20th century. A protégé of the Russian master Ilya Repin, Nicolai Fechin burst onto the international scene only two years earlier, at the 1909 International Exhibition of the Munich Künstlergenossenschaft (Artists’ Association) where he was awarded a Medal, 2nd class. 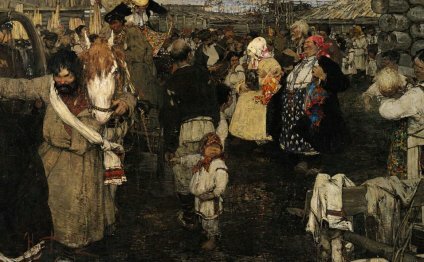 With an invitation to participate in the international exhibition of the Munich Secession in 1910, and in the Annual Exhibition at the Carnegie Institute in Pittsburgh the same year, Fechin’s portraits and depictions of peasant life in Russia became a significant “modern” presence in the major exhibitions of the day in both Europe and the United States. American collector William S. Stimmel of Pittsburgh began purchasing the artist’s paintings, among them Lady in Pink (Portrait of Natalia Podbelskaya), today a highlight of the collection of the Frye Art Museum. Considered one of Fechin’s masterpieces, this canvas was exhibited in the International Exhibition at the Carnegie Institute in 1913 and in the Panama-Pacific Exposition in San Francisco in 1915 where it was presented together with the work of Eugene Boudin, Puvis de Chavanne, Camille Pissarro, Pierre Auguste Renoir, and Alfred Sisley. Fleeing disease, hunger and the turmoil of post-revolutionary Russia, Fechin and his family moved to the United States in the 1920s. Here he continued to attract attention in the landmark Exhibition of Russian Painting and Sculpture at the Brooklyn Art Museum in 1923 and in a solo exhibition at the prestigious Art Institute of Chicago the same year where his “bold, striking technique” was praised by critics. While teaching at New York’s newly established Grand Central School of Art co-founded by artist John Singer Sargent, Fechin met Armenian artist Arshile Gorky (1904? –1948) who greatly admired his work. Fechin also kept company with Russian expatriate David Burliuk, known as the Father of Russian Futurism. Ill health, however, would force Fechin to leave New York and move to Taos where he built his own home as a Gesamtkunstwerk or total work of art and began painting portraits of the indigenous peoples of the region. Later travels to Mexico and Bali resulted in depictions of local inhabitants that echoed Fechin’s earliest portrayals of Russian peasant life. The exhibition Nicolai Fechin, curated by Frye Director Jo-Anne Birnie Danzker, provides a rare opportunity to recognize the accomplishments of this important émigré painter. With fifty-five paintings and drawings from the holdings of the Frye Art Museum, museums in the United States, and private lenders in both Russia and the United States, Nicolai Fechin concentrates on the early Russian period of the artist’s career, a period in which the Frye Art Museum has particular strength, and concludes with paintings from Fechin’s time in Taos and California. It is the first major overview of Fechin’s work at the Frye Art Museum since 1976. Nicolai Fechin is organized by the Foundation for International Arts and Education, Bethesda, Maryland; the Frye Art Museum, Seattle, Washington; and the State Museum and Exhibition Center ROSIZO under the auspices of the Ministry of Culture of the Russian Federation. The exhibition is curated by Jo-Anne Birnie Danzker and funded by the Frye Foundation with the generous support of Frye Art Museum members and donors. It is sponsored by BNY Mellon Wealth Management and the Filatov Family Art Foundation. Seasonal support is provided by 4Culture, Seattle Office of Arts & Cultural Affairs, Canonicus Fund, and ArtsFund.